In 2013 an NGU L.I.G.H.T. went to Amsterdam to create video for Trans World Radio. Serving on a missions team gives students opportunities to get to know faculty outside the classroom. A L.I.G.H.T. 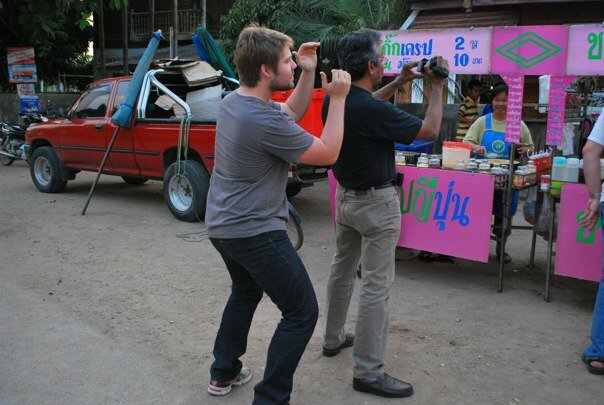 to Thailand gets to savor the local culture. Getting to know and serve people from other cultures is a great benefit of serving as an NGU short-term missionary. Students relax between flights on a missions trip to Thailand. Students on a L.I.G.H.T. team get to take in the sights and sounds of the locations where they minister. Another student on a missions trip to Thailand gets up close and personal with an elephant. Students who traveled to Amsterdam capture memories that will stay with them the rest of their lives. Opportunities to share worldviews abound on international mission trips. Student missionaries had an opportunity to talk to Buddhist monks while on a trip to Thailand in 2013. Campus Ministries at North Greenville University offers various ways for its students to get involved with mission work without even leaving the premises. Prayer Chapel - According to Beth Ross, administrative assistant for Campus Ministries, Campus Ministries is working on the chapel becoming a prayer ministry by having someone in there to pray with students around the clock. Residence Hall Chaplains - If female students are interested in volunteering as chaplains for a dormitory, they can contact Ruth McWhite, director of Women’s Ministry. Chaplains host Bible studies and prayer groups for the women in their halls. Life Transformation Groups host Bible studies as well. These groups are each comprised of three people who meet once a week to discuss scripture and hold each other accountable. Joyful Sound - Another way to get involved in campus ministries is through Joyful Sound, NGU’s praise and worship group that travels all around the east coast to lead churches in song. This is for students who love to sing and are musically inclined. NGU Campus and Blue Grass Bands are other praise and worship opportunities offered on campus. Their job is to lead worship in chapel and various places off campus. Act Two is a drama troupe that travels to about 30 places each semester to creatively act out biblical interpretations. Auditions are held in March and April. Students can also get involved with the Baptist Student Union, which meets every Thursday at 7 p.m. in Turner Chapel. The Life Answers Team is an apologetic group that travels to various churches several weekends throughout the semester. It meets every Monday night to train students how to answer questions people have about Christianity. Miracle Hill -- a Christian organization that specializes in helping men and women overcome addiction and finding foster homes for children. It owns nine thrift stores, which help support the people who live in its shelters. Miracle Hill has three children shelters and four adult shelters. Every summer NGU sends out teams all over the country to spread the gospel. Last year, Allen McWhite, director of missions, said the school sent out a women’s soccer team, as well as a few different sports teams, to missions. A modern language group went on a mission trip, too, and another team from NGU traveled to help with disaster relief. Last year, the North American Mission Board (NAMB) requested NGU students to travel to West Virginia to do mission work. Chris Wolfla was among them. He and his team were counselors for three different youth and children’s camps. They also worked at various churches’ vacation Bible schools. “We learned what it means to serve the community the way God called us to,” said Wolfla.McWhite also said many students went out on mission trips individually, obtaining the opportunities through the International Mission Board, the North American Mission Board and Samaritan’s Purse. McWhite said, “This fall we will be unveiling our teams and opportunities this academic year and we will also be unveiling the new strategies to do that.” If students are interested in national mission trips, they can contact McWhite at allen.mcwhite@ngu.edu. The International Mission Board of the Southern Baptist Convention sends teams around the world and so does North Greenville University. L.I.G.H.T. Teams are NGU mission groups that travel across the globe and spread the gospel, focusing on three specific people groups – Latin Americans, South Asians and North Africans in the Middle East. As students tell others about Christ, they have the chance to grow in their own faith, too. Katie Baker is studying to teach English as a second language, and she was a member of the team that traveled to Jordan last semester to teach English in a school. She said she couldn’t pass up the opportunity to visit the Middle East. She said she got to know the children well, and she met some Christians in Jordan, too. She said they have to lead careful lives. “To see these people put their faith in God even under the circumstances makes my faith all the more strong that we have an awesome and powerful God who reigns over all the earth,” Baker said. While Baker’s team was serving in Jordan, another L.I.G.H.T. team was serving in Nicaragua. Casey Goodwin said this was her first mission trip. In Nicaragua, she and her team led a Vacation Bible School and laid concrete for a church. “Through seeing people who have far less than I do having so much love for God was very humbling. It was a big eye opener to what loving God can look like,” she said.